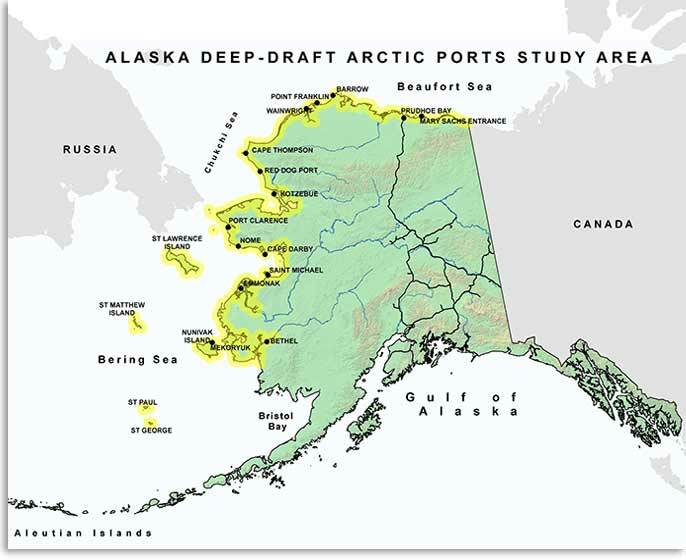 The Alaska DOT&PF and the Army Corps of Engineers are co-sponsoring the Alaska Deep Draft Arctic Ports Study to evaluate potential deepwater port locations. The Arctic coast is experiencing increased vessel traffic, a reason for concern for the State of Alaska and federal agencies. An Alaskan Arctic port would serve as a major infrastructure asset and the northernmost port for the US Coast Guard (USCG), the US Navy, and the National Oceanic and Atmospheric Administration (NOAA) in protecting and patrolling an important US coastline. Study efforts for include: defining the study area, identifying other agency efforts, evaluating public/private partnerships, examining problems and opportunities, establishing siting criteria, conducting scenario analysis, identifying potential sites, engaging stakeholders and communities, and rescoping study effort as needed for following years. In 2008, the Alaska DOT&PF and the Alaska District Corps of Engineers held the first Alaska Regional Ports Conference bringing together 125 representatives from local, state, and federal government agencies, private transportation businesses, and tribal entities to share visions and concerns about Alaska’s waterways and infrastructure. The overwhelming mandate was the need for a collaborative planning effort. Following the 2008 Conference, the Alaska DOT&PF commissioned a large study of Alaska’s Regional Ports and Harbors which included a baseline assessment of infrastructure needs, strategic trends, regional hub identification, and policy and plan development. In 2010, a second conference was held to review progress and next steps. In May 16-17, 2011, DOT&PF and the Corps held a 2-day “Alaska Deep-Draft Arctic Ports Planning Charrette” with federal, state, local, and industry representatives to start the process of joint planning for U.S. Arctic Ports in Alaska and addressing deep-draft port needs. The Charrette participants helped shape the scope for the Alaska Deep Draft Arctic Ports Study. Started in December 2011, the Alaska Deep Draft Arctic Ports Study has identified a tentatively selected plan to address the needs for enhanced marine infrastructure to support offshore oil and gas industry, search and rescue, and oil spill response. The U.S. Army Corps of Engineers - Alaska District released a draft feasibility report and environmental assessment that selects an alternative that establishes a deep-water port in Nome to support increased vessel traffic and economic development in the Arctic. Public comments are being taken now until April 17, 2015 on the Tentatively Selected Plan. Please send comments to AKregports@usace.army.mil. For purposes of this Alaska Deep-Draft Arctic Ports Planning Study, the planning team has narrowed the study area to the waters at the mouth of the Kuskokwim River, including all of western and northern Alaska’s coastline. This area represents 3,626 miles of U.S. coastline, more than Maine to Key West which is 2,069 miles. To the right is a map showing the project study area in yellow. Based upon existing definitions of the Arctic as well as the comments from the May 2011 Deep-Draft Ports Planning Charrette, this specific study area was selected because it is the area most in need of deep-draft port development. Currently, there are deep draft ports serving Anchorage, Seward, Valdez, Kodiak, Unalaska, and Homer, but none along Alaska’s Arctic coastline. Who is doing this study? This study is a collaborative effort between the USACE Alaska District and Alaska DOT&PF. RISE Alaska, LLC has been contracted to facilitate, manage and develop work products related to this study. A Project Development Team has been formed to produce this study. Why do we need a deep-draft Arctic port? Our state and federal congressional leadership have highlighted several reasons why Alaska needs an Arctic port: maintaining sovereignty in light of increased Arctic traffic and activity; diversifying Alaska’s economy; Arctic Search and Rescue coverage/responsibility; and protecting U.S. air, land and sea borders. What criteria will be used to select the site for the Arctic port? In May 2011, the USACE and DOT&PF hosted an Arctic Deep-Draft Ports Planning Charrette with state, federal, tribal and private stakeholders. During this charrette, participants outlined proposed criteria selecting a site for Arctic deep-draft port(s). This criteria will be used as the starting point for the study and refined by the Project Development Team. How will Alaska’s communities and stakeholders be involved in this planning process?There will be ongoing consultation with stakeholders throughout this project. The project team will engage communities and interested parties throughout the process and build upon previous study and research efforts related to the Arctic. How will the design, construction and operation of the deep-draft Arctic port be funded? It is too soon to know. The Project Development Team is looking at a public-private partnership for design, construction, and operations as the most likely funding scenario. Will anybody be able to use the port? When will the port be built? The timing and access to the port will depend on the purpose of the specific port as well as the partnership to finance, build, and operate the port. Port construction using public funds must stipulate public access. How can I learn more about previous efforts? Please click on the “Resources” links below to read more about the 2008/2010 Alaska Regional Ports Conferences and the May 2011 Alaska Deep-Draft Arctic Ports Planning Charrette. How can I comment? Please use the comment form below to send comments directly to the Project Development Team for this study. All comments will be reviewed and responded to in a timely manner and kept as part of the project record. Additional FAQs are posted on the Corps of Engineers website and available at this link. If you do not have Acrobat Reader, click to downloadthe FREE software.